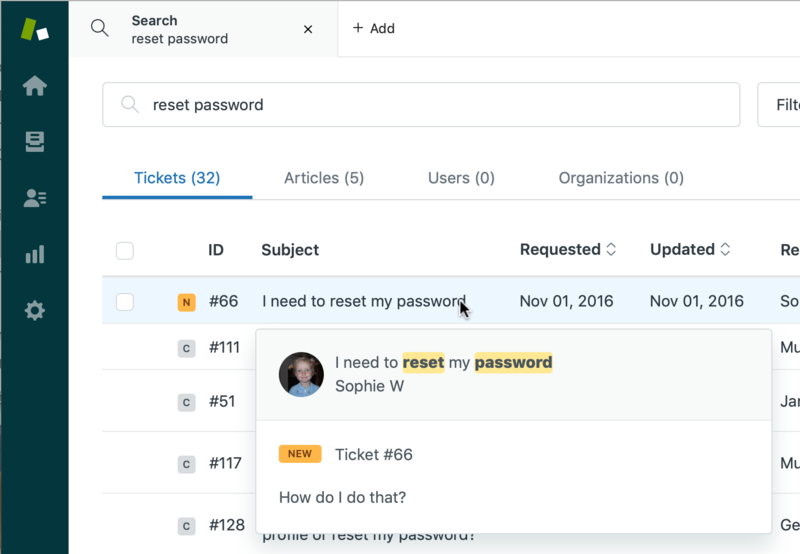 In Zendesk Support, you can search for data, such as ticket properties, user properties, comments, tags, Help Center articles, and so on, using the search tool, located in the top toolbar. Administrators can search everything, and agents can search the tickets and users that they have permission to see. For example, if as an agent you are limited to only seeing tickets in the groups that you belong to, you will only be able to see those tickets in your search results. 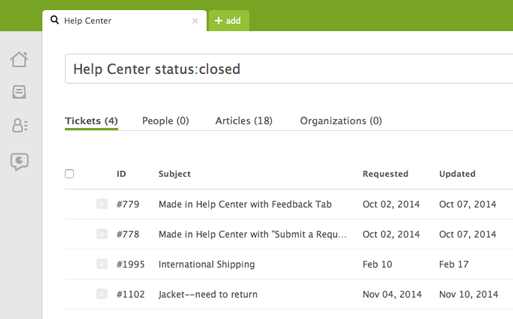 There are a few ways you can get to the Zendesk Support search tool. Or you can use the keyboard shortcut (control + alt + f), which opens the simple search box. A simple text search gives you an unfiltered list of everything you can access that contains your search terms. Enter your query in the search box. Your search results are displayed in a new tab on the toolbar. In addition to the full text search, you can narrow your search results using search filters. You can filter for just the type of elements you want to see: tickets, articles, users, or organizations. Each category offers relevant ways to further refine your results. Hit Enter, or click Advanced search. Enter your search terms in the text bar, then click Filters. Click the Search dropdown to select the type of element you want to include in your search. Fill out the options as needed to refine your search. You can further narrow your search results using search operators and keywords. For more information on this kind of advanced search, see Zendesk Support advanced search. Hovering your cursor over the subject of a result displays a preview of that ticket, allowing you to glean more information about the ticket without having to open it. In the preview window, snippets of comments or fields containing your search term(s) are displayed, with the search term(s) highlighted, so you can determine whether the ticket is relevant to your search before opening it. Hover your cursor over the subject of a result to display a preview of that ticket. 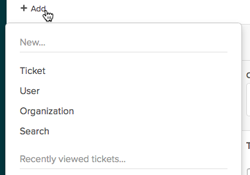 Your search results are sorted into categories for tickets, users, articles, and organizations. Each category contains different columns, icons, and other elements, to help you identify, filter, sort, or otherwise organize your search results. Click the category at the top of the search results page. ID, the ticket's numeric identifier. Subject, the text from the ticket's subject line. Requested, the date the ticket was submitted. Updated, the last time the ticket was updated. Requester, the name of the user who submitted the ticket. Group, the group assigned to handle the ticket. Click anywhere on a ticket result's row opens that ticket in a new tab. Click on the Requested or Updated column in the search results to toggle between displaying results in ascending or descending order by date. Name, the user's submitted name. Email, the user's email address. Organization, the company or group they work for. Role, the role assigned to that user (agent, admin, end-user, and the like). Updated, the last time the user's profile was updated. Click anywhere on a user's row to open that user's profile in a new tab. Updated, the last time the article was updated. Created, the date the article was posted to the knowledge base. Click anywhere on an article's row to open that article in a new browser window or tab. Name, the organization's submitted name. Notes, any notes added to their profile. Created, the date the organization first registered. Updated, the last time the organization updated its profile. Click anywhere on an organization's row to open that organization's profile in a new tab. You can make ticket updates to many tickets at the same time. For example, if you want to assign yourself to a number a tickets, you just select them in the search results and set yourself as the assignee. You can also delete, merge, or mark as spam the selected tickets. In your search results, select the tickets you want to update. You can pick and choose the tickets you want to update, or select the entire list by clicking the check box at the top left of the results list. Click the Update X ticket(s) button to open the ticket editor. Update the ticket information as needed. See Bulk updating, deleting, and merging tickets for more information on bulk updating. Click Submit to apply the changes to your selected tickets, or click the menu dropdown on the Submit button to apply the changes. You can create more complex search statements using search operators and keywords. You can restrict your searches to look for specific ticket, user, article, group, or organization data. To do this, you use the data object properties as keywords in a search. For example, the following search returns all closed tickets containing the words "help" and "center." Zendesk Support also includes search operators commonly used when searching the Internet, such as: (equals), > (greater than), < (less than), and "" (phrase search). For all of the details about searching your data in Zendesk Support, see Zendesk search reference in the Administrator Guide. You can copy search query strings you create in Support to your clipboard, where you can then share them with other users. When you share a search query with another user and they click it, the string will perform the search in their own Support instance using the same query you created. In the Support search box, enter a search query. Click the copy and share search query icon as shown in the image below. The search query is copied to your clipboard as shown in the image below. You can now send the query to other users, for example, by pasting it into an email. I'm about to launch a very small beta for agents who are searching for articles in the agent interface. This beta will not change the search experience for anyone in Help Center, but rather is a precursor to that step. You will not see any interface changes during this beta, as the change only impacts the results themselves. You will also not be able to search for community posts within the agent interface quite yet. You'll be able to choose whether you'd like this rolled out to your entire account, or, if you'd prefer, you can turn it on for individual agents. I don't understand zendesk search. I have for example a ticket with an order number in the subject. When I search for this number, the ticket doesn't come up ! Please help. Also I'm an admin, so it isn't a problem of tickets i'm not allowed to see. I just wanna ask if there is a way that I can use this search with Zendesk Application Framework v2? like for example, I will pass a string for my app and then this zendesk search will do its job to populate the list. Also, I tried to use the routeTo function of api, but it only support user, organization and ticket. I thought search is available because it also possible to add a tab for the search but unfortunately not. It will be really a great help in our team if this feature is available. If you know any alternatives please let me know. Thank you. Hey Austin! I'm checking with out Developer Relations folks to see if we can find an answer for you. Sit tight! Thanks for writing in. I think this is best served over in our Zendesk Apps Developer Community - may I ask you to please cross-post? You have posed some great questions here, and I would also ask if you could please expand on what it is you are trying to achieve overall, what your use-case is. You have a couple options in regards to search - client.request() to achieve locally, or your own application hosted elsewhere. Depending on the nature of the data you would be retrieving would determine the design choice here giving consideration to performance. Please join us over in the Developer Community I linked above and engage with our other members who may have other methods and advice to provide. Is there a way to see the Organization as a column in the Tickets tab? Welcome to the Community, Megan! Sorry for the delayed response. There isn't a way to customize the columns in the search results, but you can customize them in Views. Can you tell me more about what you're trying to do with your searches? It might be that using Views would get the job done better.